Israeli developer Playtech first launched this spinning wheel lottery game in early 2018, but took it off the market again soon after. Now its back with a bang – and you can play Spin a Win at many online casinos offering Playtech games. 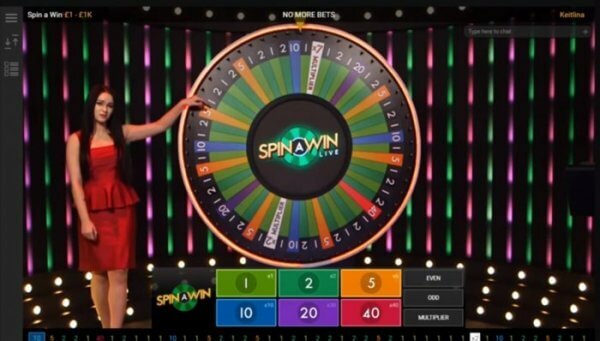 Spin a Win is markedly similar to Evolution Gaming’s Dream Catcher, but you can’t really copyright betting on a spinning wheel. So fair game! If you don’t know Wheel of Fortune type games, they are pretty simple. The live dealer spins a colourful wheel with a marker at the top and you bet on which numbered section of the wheel you think it will stop on. Winning bets are then paid out based on the odds of each particular segment, which are usually the same as the number. So the number 2 pays out 2-1, 3 pays 3-1 and so on. There are also multipliers, that trigger a second spin of the wheel and then multiply any winning bets by that amount. Spin a Win distinguishes itself from Evolution’s and other offerings, by offering side bets. These include odd and even numbers, or you can even bet on the wheel landing on a multiplier. They also hide the clicker, the pointer that stops on each segment, behind the wheel. This confused us a little, as a lot of the excitement of Evolution’s title was generated by watching the little clicker flick between two options. But hey, hardly a game-breaking feature. To be honest, its the live hosts that make or break these kind of games – and Playtech’s team for Spin a Win are enthusiastic bundles of joy to play with! All in all? Spin a Win is not the most skill based game you’ll find out there, but a welcome and exciting addition to the live casino pile nonetheless.